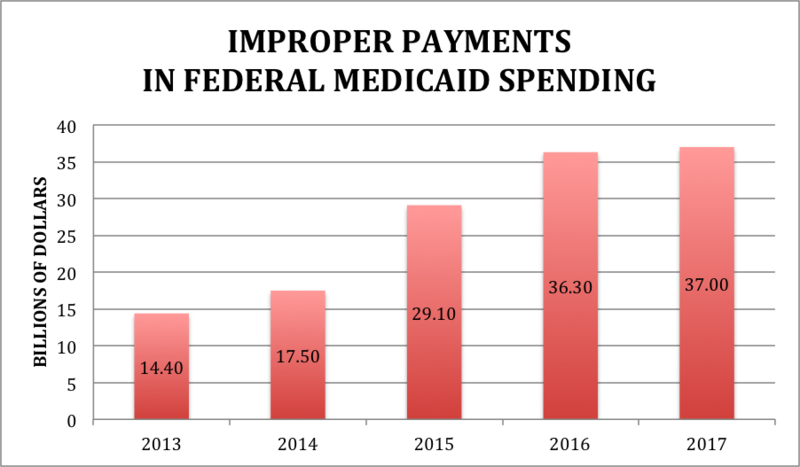 In 2017, improper payments within the Medicaid program reached a total of $37 billion according to CMS. That equals 10 percent of the federal dollars spent on the program. Moreover, 99.2 percent of the payments made were overpayments. To make matters worse, under the current legislation, national health spending is expected to reach $5.7 trillion by 2026. When considering the soaring costs of healthcare and the program’s growth from expansion under the Affordable Care Act, governmet officials are concerned about sustainability. In an effort to address Medicaid fraud and overpayments, the Senate Homeland Security and Governmental Affairs Committee held a hearing in June. Over the course of the hearing, the ranking members and witnesses discussed the rising costs associated with Medicaid and what efforts should be made so that federal dollars are spent efficiently and effectively. Comptroller General Dodaro represented the GAO at the hearing and presented actions to mitigate improper payments and program integrity risks. He pointed out that Medicaid’s unique state-by-state structures combined with the size of the program are two elements that make overseeing the program challenging. Click here to view the GAO’s complete report. Inspector General for Audit Services, Brian P. Ritchie represented DHHS and also weighed-in on the challenges facing Medicaid. The Inspector General identified high improper payments rates, inadequate program integrity safeguards, and beneficiary health and safety concerns as risks that compromise the sustainability of the program. Additionally, he testified that in order to preserve the program there needs to be more robust efforts made in regards to prevention, detection, and enforcement. Read the department’s complete list of recommendations here. Nearly a month after the meeting, the Senate Homeland Security and Governmental Affairs Committee conducted an additional hearing with the Administrator of The Centers for Medicare and Medicaid Services and the US Comptroller General. The hearing focused on examining CMS’s efforts to protect against fraud and overpayments within Medicaid. The GAO expressed that while CMS has taken measures to address these threats, more action is needed in order to strengthen the program’s integrity. In addition, Administrator Verma encouraged the optimization of data. She stressed it’s significance in protecting the integrity of the program. CMS is working to improve the Medicaid program’s integrity by implementing advanced analytics and technologies for the collection of health services data. In June, each of the 50 states, including Washington D.C. and Puerto Rico, started submitting data from their programs to the Transformed – Medicaid Statistical Information System (T-MSIS). The system is designed to monitor key information such as: enhanced information about beneficiary eligibility, beneficiary and provider enrollment, service utilization, claims and managed care data, and expenditure data for Medicaid and CHIP. Moving forward, the agency will be responsible for determining the quality and completeness of the data submitted. Click here to read Administrator Verma’s full statement. The Medicaid program is one of the nation’s largest sources of funding for medical and health-related services. Due to concerns over the program’s fiscal oversight and it’s significant amount of improper payments, Medicaid has been on the GAO’s “High Risk List” since 2003. As the program continues to grow, government officials and federal agencies are working to address problems rooted in waste, fraud, and abuse in order to protect it’s integrity.